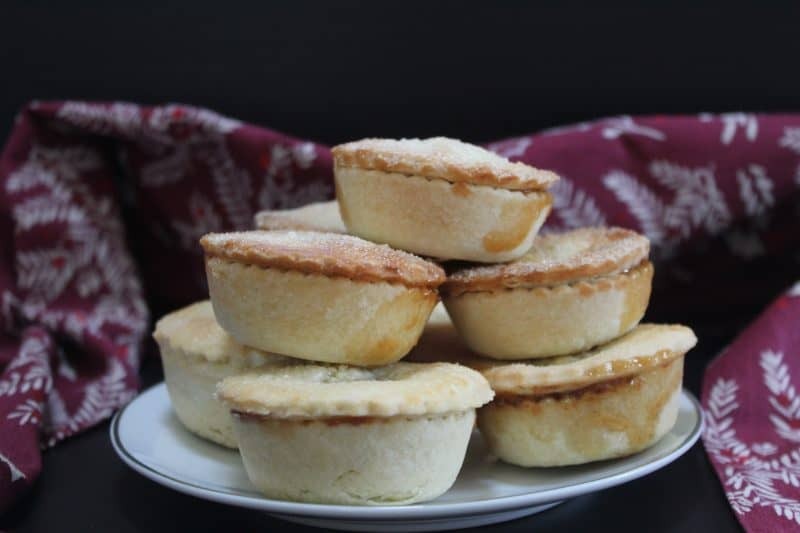 It’s always tough when you see ‘normal’ food you really want to eat – so when I saw some rum and salted caramel mince pies on the supermarket shelf I knew I had to make a gluten free version. They have been a real labour of love, but I’ve finally perfect the recipe and am really excited to share it with you all! Now I am a massive fan of salted caramel, but the idea of rum salted caramel really appealed to me. Even more so when paired with a buttery gluten free pastry and sweet mincemeat! 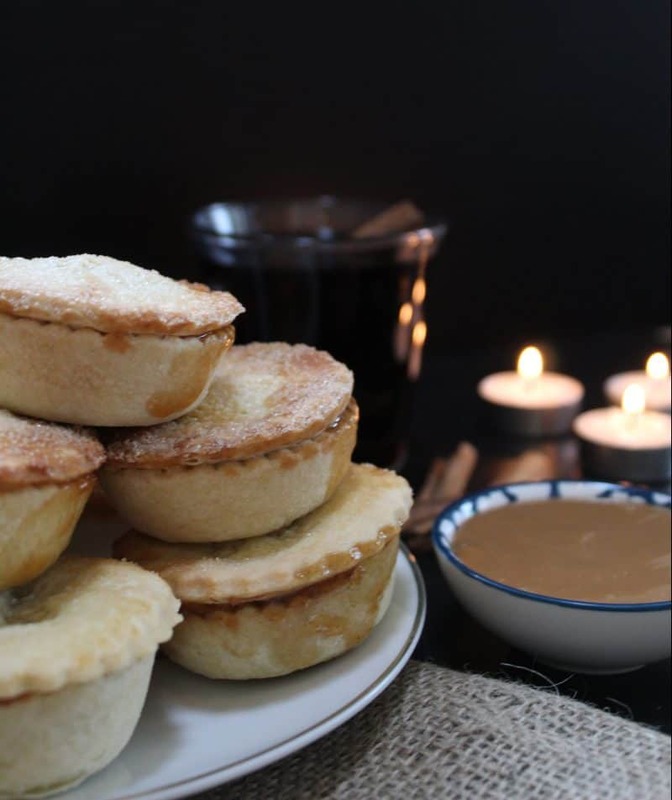 I always make gluten free mince pies at Christmas – with a glass of mulled wine and some Bublé in the background, it doesn’t get much better than that! For this recipe I used ready made mincemeat and caramel to save time, but you could make your own gluten free mincemeat using this recipe, and your own caramel using this recipe. 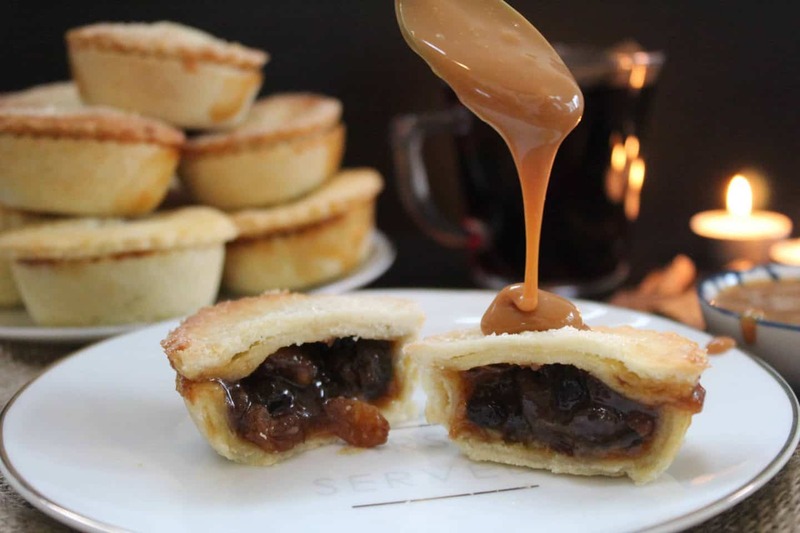 These gluten free rum and salted caramel mince pies are decadent and best enjoyed warm. I like them with custard but you could have them with cream, ice-cream, or just some of the extra caramel sauce. They’ll keep for a few days in an airtight container, but making them last that long might be a struggle! For the gluten free pastry I used the same recipe as my gluten free Bakewell tart, but I added a little extra sugar as I wanted them to be a little sweeter! The pastry is really easy to handle, I didn’t even need to use clingfilm – just a little dusting of flour. It’s not sticky at all and tastes delicious. I think these would be a lovely recipe to make on Christmas Eve, but they might be a bit too naughty for Father Christmas, so you’ll have to eat them all yourself! They’d be perfect party food (try them after my ‘tear and share’ gluten free brie and cranberry bread) and I doubt anyone would even know they are gluten free! You’ll have to let me know if you surprise anyone! 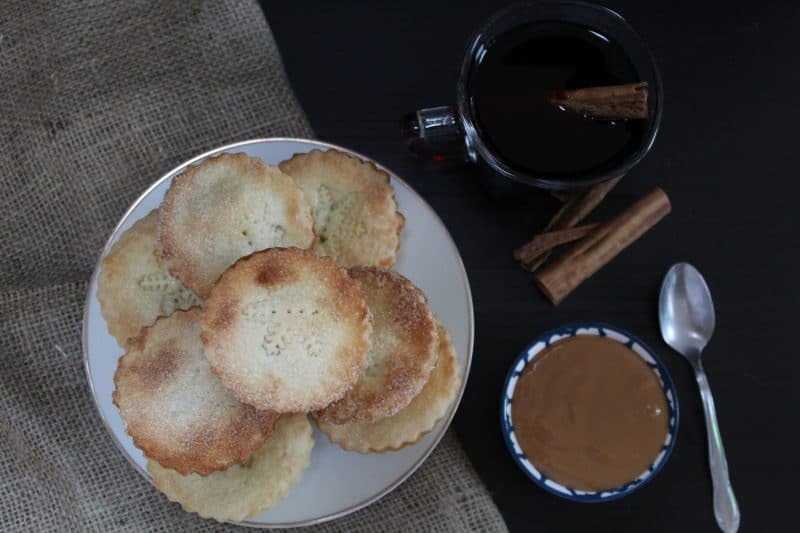 So if you want a delicious gluten free mince pie recipe with an extra special twist, try these naughty-but-nice gluten free rum and salted caramel mince pies. You’ll never go back! Some notes on the recipe before you start – this makes around 10-12 mince pies but that depends on how thick you like your pastry! I used a snowflake stamp on the top of my pies to add a pretty festive top, which I picked up at a local cook shop. I did try this recipe a few times with star-shaped lids, but they just exploded! So I would definitely recommend using a full lid and pricking the top with a fork before you bake it. These gluten free rum and salted caramel mince pies are decadent and rich, the perfect gluten free Christmas party food! Preheat the oven to 180C/Gas 4. Lightly grease a 12-hole muffin tin with some butter/margarine and set aside. In a large mixing bowl add the flour, butter, sugar, salt and xantham gum. Using your fingers, rub together until the mixture resembles breadcrumbs. Top tip - I find it helps if your hands are cold when doing this. Add the beaten egg/water mix and use a fork to press together. Once the mixture starts to come together, use your hands to form the pastry into a ball. Wrap in clingfilm and chill in the fridge for 30-40 minutes. To make the caramel, mix the rum and the caramel together and stir well until fully combined. Taste and add a little extra rum if you like! Once the pastry is chilled, dust the worktop with a little extra flour and roll the pastry out to about 2-3mm thick. Cut 12 circles and press gentle into the muffin tin holes. Prick the bottom of each with a fork. 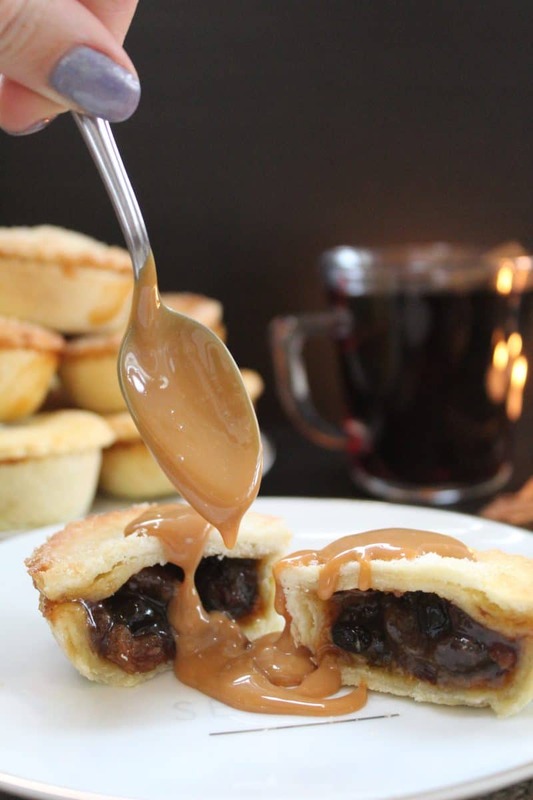 Spread 1 tsp of the caramel mixture into the bottom of each mince pie case. Add 1 tbsp of mincemeat on top of the caramel. Re-roll the pastry to 2-3mm thick and cut another 12 circles, the same size as the muffin tin holes. Brush the rim of the mince pie with a little milk using a pastry brush, then press the pastry lid on top. Prick the top with a fork. Brush each lid with a little milk and sprinkle with a little extra sugar. Bake in the oven for around 15 minutes until the pies are golden brown. Cool on a wire rack and, once they have cooled a little, remove the pies carefully using a knife. Enjoy warm or cold.